2018 Honda CB1000R. Picture credits - Honda. Submit more pictures. The unique chassis incorporates a single-sided swingarm with a high performance single-shock rear suspension that helps make this bike stand out as well as perform. Some might call it a naked bike. Some might say it�s an open-class street fighter. We just think it�s an awesome motorcycle for whose who like their bikes served straight up. Price as new (MSRP): US$ 11760. Prices depend on country, taxes, accessories, etc. Ask questions Join the 18 Honda CB1000R discussion group or the general Honda discussion group. Bikez has discussion forums for every bike. 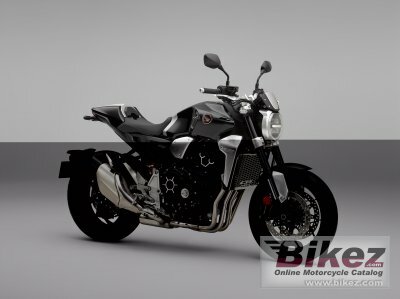 View comments, questions and answers at the 2018 Honda CB1000R discussion group. You can sign up for e-mail notifications when other riders answer you. If you have extensive experience with the MC, please send us a review. If you consider buying this bike, you should view the list of related motorbikes Look at photos. Compare technical specs. And check out the rating of the bike's engine performance, reliability, repair costs, etc. You can compare the rating with other bikes.